There is nothing like having power on the go when you are outdoors on your favorite weekend activity of kayaking or boat riding or even a game of golf. The Might Max M135-12 is one of the best solar batteries that is both heavy-duty and state-of-the-art. This deep cycle battery can be used for both your float and cyclic applications. When you go camping, don’t worry about keeping all your gadgets like cell phones and laptop charged or using your marine radio or even your Bluetooth speakers. With its state-of-the-art heavy duty calcium alloy grid, the Might Max gives maximum performance and lasts longer. It uses Absorbent Glass Mat (AGM) technology making battery leaks and corrosions, a thing of the past. The Mighty Max can power almost an endless list of tools and devices from consumer electronics to electric vehicles to emergency devices and devices related to hobbies like outdoor sport and recreation. True to its name, the Mighty Max is packed with features for its small size and price point. Read on as we tease the best features of the Mighty Max Ml35-12 that makes it a great deep cycle, solar powered battery. The Mighty Max is both compact and lightweight making it ideal for a lot of outdoor uses like powering trolling motors, automatic golf carts, gardening tools, portable medical devices etc. It is half the size of most batteries and weighs only a fourth of the weight of regular batteries. Unlike traditional flooded batteries, the Mighty Max Ml35-12 uses AGM (Absorbed glass Mat) technology, which means the electrolytes are spread over the absorbent fiberglass and so there is no liquid that can leak out. This makes the battery virtually leak-proof and is also safe for the user. The Mighty Max is a sealed lead acid (SLA) battery that is also called a valve-regulated battery, which means, it comes with a valve to let gases escape in case of overheating, thereby reducing damage to the battery and the need for ventilation. AGM batteries, by virtue of their design and technology are also less prone to corrosion, so you can focus more on the activity at hand, rather than worrying about the clean up and maintenance of your power source. Due to the use of AGM technology and being sealed batteries, you can position the Mighty Max in any orientation and it will work perfectly fine. The body of the Might Max deep cycle has been specifically designed to be sturdy enough to withstand shocks and vibration as is expected with a portable application. As you will be using it outdoors, it will also be subjected to variations in temperature. But the Mighty Max works very well in a wide range of temperatures, giving you peace of mind. The Mighty Max, being an AGM battery, has thicker plates that allow you to discharger deeper without worrying about running out of power too soon. They also charge must faster than non-AGM batteries or flooded batteries, typically about five times faster. Even if you are not going to be using the battery for some time, you don’t have to worry about discharge, as the AGM technology of the Might Max allows for a much slower discharge than regular flooded batteries when they are not used. In case you don’t have enough clear skies for the battery to be recharged, you don’t have to worry about running out of power as the Mighty Max is also compatible with other chargers and can be used when you have cloudy conditions for days together. However, this will be a rare situation as you can very well manage for almost 3 days without recharging the Mighty Max, especially if you are out camping. No review is complete without mentioning the drawbacks of a product. When it comes to the Mighty Max Ml35-12, the positive features seem to outweigh its negative ones. Nevertheless, even a small negative feature could make you go for another product as individual requirements can vary. Here is why the Mighty Max Ml35-12 may not be what you are looking for. No connectors in the box – The battery does not come with wire connectors which needs to be bought separately although they do come with a set of bolts and nuts for the connectors. An advantage to this is that you can customize the length of the connectors according to your individual needs. Not powerful – Though the 12V, 35Ah configuration is great for many applications, it cannot be used in place of a powerful battery. Is the Might Max deep cycle better than other batteries? In this section, we compare the Mighty Max solar battery with similar models in the market to see how it fares. The Mighty Max is a great deep cycle battery that comes at a really affordable price tag too. So if you want to try it without spending too much, then you can also look at solar batteries for sale where you can get some great discounts. The Odyssey 34-PC 1500T is also similar to the Might Max M135-12 as they both are SVR (Sealed Valve regulated) batteries that use the AGM (Absorbed glass Mat) technology. Although the Odyssey 34 PC is a dual purpose battery, the Mighty Max being a deep cycle can be used for both cranking and longer durations. Also some users of the Odyssey battery have experienced overcharging issues which are not seen with the Mighty Max. The Chrome SLA-12V-35AH-T3, like the Mighty Max M135-12 is a deep cycle, solar powered sealed lead acid battery. Many customers have found that in the Chrome SLA solar batteries deep cycle feature does not work satisfactorily as the battery does not allow for multiple discharges and does not last long as a deep cycle battery should. In some instances, the battery has died just after a month’s use. 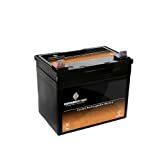 The posts of the Chrome SLA are also smaller than the Mighty Max deep cycle The Mighty Max clearly wins as a long lasting deep cycle battery and comes with a one year warranty. The Universal UB12350 is also a sealed Lead acid battery similar to the Mighty Max and also has the same 12V and 35 Ah configuration. Though both the batteries are priced almost the same, the Might Max will be a better bet if you are looking for a more compact battery as its dimensions are 7.68 x 5.16 x 7.13 inches when compared to the slightly larger dimensions of the Universal UB12350 which measures 8.1 x 8.1 x 5.9 inches. If going out camping or kayaking is your favorite thing to do and you hate the incredibly high solar battery prices, then the Mighty Max Ml35-12 is your budget-friendly option which will fulfill all your power needs. Also, just having a portable and compact power source is not good enough. The Mighty Max Ml35-12 has a recharging option and that too one that does not let you go looking for power sockets as it can be recharged solely with solar power. Carrying your battery along or using it for your outdoor power requirements does not have to make you worry about spending time and money on its care and maintenance. With the Mighty Max Deep Cycle, you can almost forget that you have a battery on-board as it lets you go maintenance-free with its leak-proof and sealed battery design. So when you buy the Mighty Max Ml35-12, you are not just buying years of maintenance-free power supply, but peace of mind too. 3 Is the Might Max deep cycle better than other batteries?